This recipe came about because once a year when it gets close to Christmas, one of my best friends requests a recipe from something he’s seen me cook. This is 2018’s request. I had to make this a few times to get the mascarpone layer the way I imagined it the first time I came up with this cake. 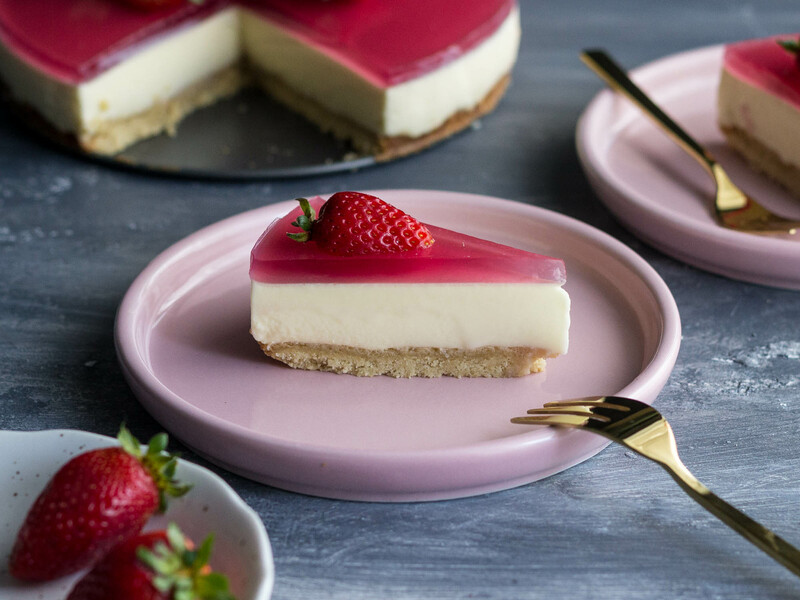 I didn’t want it to taste like cheese cake or cream – I wanted it to have a panna cotta like texture. Like panna cotta you can wobble it on your plate. Each step doesn’t take long but there’s waiting in between each layer for things to cool or set. I usually make it over two days so that I don’t rush it and end up with mascarpone floating in my jelly. To make the base, mix the butter, almond meal and brown sugar in a mixing bowl. Press the mixture into the base of a 19cm spring form pan and make sure it reaches right to the sides of the pan. Bake in the oven for 8 minutes. Set aside to allow it to fully cool down. To prepare the mascarpone filling, bloom the gelatine first. In a small bowl, whisk the powdered gelatine into 50ml of milk and allow it to bloom for 5-10 minutes. In the meantime, in a saucepan, add the mascarpone, caster sugar, cream and 100ml of milk. Gently whisk the mixture together but trying not to beat too much air into it. Warm the mixture over medium heat till it just starts simmering – it needs to be hot but not boiling. Using a whisk, gently incorporate the gelatine mixture into the saucepan. The gelatine should fully dissolve into the mixture. Set the pan aside for 30 minutes to allow it to cool down slightly. Place the spring form pan with the almond meal base onto a baking sheet. Grease the inside of the spring form pan very lightly with oil – it shouldn’t be dripping or running down the side. Pour the mascarpone filling over the base. Prepare for the fact a little bit of the mixture may escape through the base. Don’t stress about it, that’s what the baking tray is for. Leave the mascarpone filling to cool down to room temperature on the bench before covering it and placing it in the fridge. Usually I refrigerate it overnight so it can set. The next morning, make the jelly as per the instructions on the packet. It needs to cool down to room temperature. Pour 1 cup of the jelly over the mascarpone filling whilst the spring form pan is still in the fridge. Let it set in the fridge for a few hours or until the jelly layer is firm before serving. The left over jelly mixture can be poured into moulds to set and eaten as a snack. To release the cake, run a sharp knife around the cake to loosen it from the sides of the pan. When you release the latch on the spring form pan, it should pull away. To cut up the cake, warm a knife under hot water and make sure to wipe it clean in between each cut.